This magnificent necklace features multi Tiger Eye & White Opal Stone Nugget Chips beaded multi drop Tassel Necklace. The Tiger Eye & Opal stone Nugget is used to increase self-confidence courage & assertiveness. 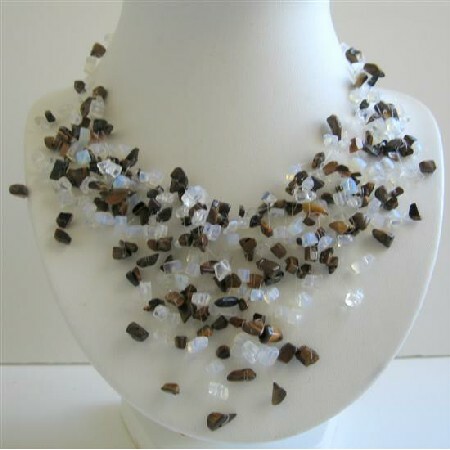 Jazz up your clothing with this stylish beaded Tiger Eye & Opal Stone ensemble! Versatile design is combined with splendor as graceful earrings a beautiful necklace multi tassel necklace iridescent Necklace & look pretty with many of dresses. Celebrate your individuality. Variations in the color & pattern.